Extension professionals provide professional training, resources, and expert advice. Family and Community Health Sciences Department: Education focusing on handwashing, food safety in the home, ServeSafe training, food safety education for youth, food allergies, and home food preservation. Contact the FCHS professional in your Rutgers Cooperative Extension county office for information. . Emergency Readiness for School Food Service - Be ready before a crisis. Tips for feeding students during an emergency or when serving as an emergency shelter. Rutgers Food Innovation Center: a food business incubation and economic development accelerator program. FIC is a food industry resource focused on developing, commercializing, marketing and selling food and beverage products. Social Marketing Campaign Materials for College Campuses - Addresses food safety knowledge and behavior gaps from a nationwide study of college students. 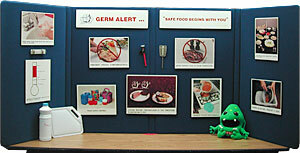 Germ Alert...Safe Food Begins with You! - Photographs showing safe food handling with English & Spanish captions (see below). Some species of fish contain unsafe levels of contaminants. This exhibit helps pregnant women and high-risk individuals with compromised immune systems make safe choices when eating fish. Includes handouts.